What do you do when you are sent a beautiful, plump, has-had-a-good-life Organic Free Range Chicken and you live on your own? Well, of course you roast it and invite your friends round to eat it. The lovely people at Abel & Cole offered for me to try one of their whole chickens. There was no way I was going to keep all that joy to myself. Even if I had wanted to I would have struggled, as it was a nearly 5lb beauty of a beast. As much as I love roast chicken leftovers, I didn't really fancy eating them every day for a week. This meant that last night E, JM, B and L came round for roast chicken dinner. I woke up in the morning feeling like trying something slightly different and not just going for the usual Lemon Roast Chicken or Rosemary and Garlic Roast Chicken. 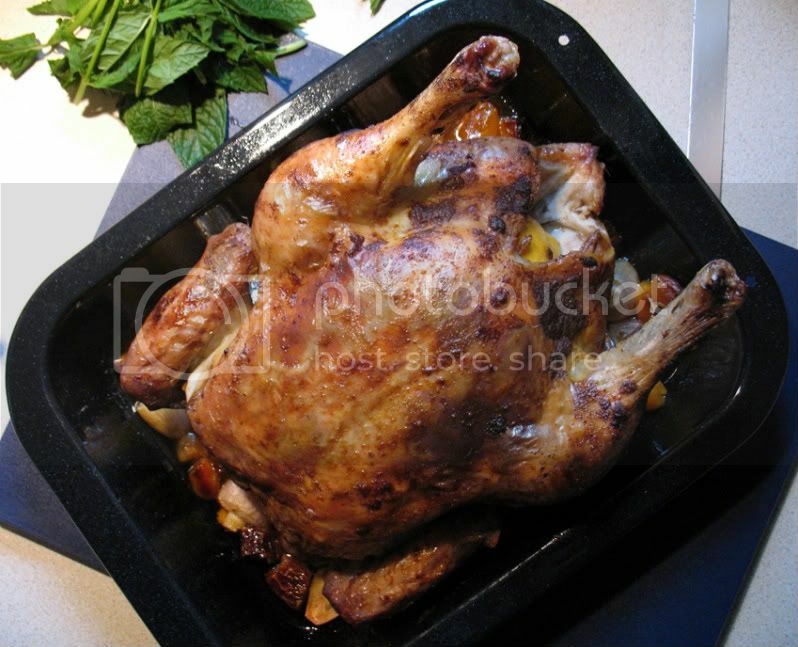 Looking for recipes I found one for Moroccan Roast Chicken that sounded pretty good and I planned the menu from there. We ended up having the chicken with chickpea couscous and a carrot and fennel salad, followed by a completely un-Moroccan rhubarb crumble. I'll share the other recipes later, but for now here's the recipe for the chicken with my adaptions and changes. The instructions and ingredients seem quite long, but it is really easy and everyone enjoyed it. Mix the soft butter with the cumin, coriander, paprika, cayenne and cinnamon and season with salt and pepper. Clean your chicken, inside and out under running water and pat it dry with kitchen towel. Carefully slide your hands between the skin and the meat on the breast side and top of the legs and rub in half of the spice butter. Rub the other half all over the skin. Cut the lemon in half and place it inside the cavity. Set the chicken breast-side-up on a rack in a roasting pan, which is also suitable for use on the stove top. Place the onion, garlic cloves, dates and dried apricots into a roasting pan and add 1/2 cup of water. Place the chicken breast side up on a rack into the roasting pan and place in the oven. Your chicken will need 20 minutes per lb plus an extra 20 minutes. After about half an hour turn your chicken over carefully and baste with the juices that are collecting in the pan. Leave for about another half hour before turning and basting again, at this point you should also add another 1/2 cup of water. Continue to roast, basting once more, until completely cooked and the juices run clear when you insert a skewer into the thickest part of the thigh. Remove from oven and drain any juices that might be caught in the cavity into the pan. 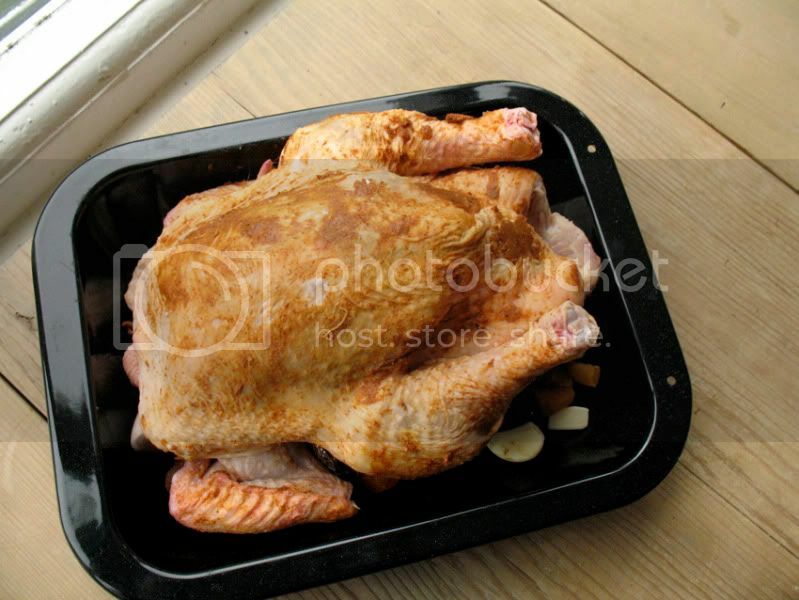 Set the chicken aside and leave to rest for about 10-15 minutes, cover with tin foil to keep warm. Remove the rack from the pan and spoon off the fat or use a gravy separator to make it even easier. Set the pan over high heat on the stove top, add the stock and harissa and cook, scraping up any browned bits. If you like you can add a little cornflour/water paste to thicken the gravy. Carve the chicken and serve with the chunky gravy. This is a beautuful change from our usual roasting flavours Sylvie.So glad you shared with us. I can't get enough of Moroccan food, I'll be trying this recipe for sure! Was this from Food and Wine? I made their Moroccan Roast Chicken and it was incredible. So cool that organic companies are sending you chicken! Val, you're right it made a good change. Sam, try it you won't be disappointed. Brittany, that's where I saw the original and then I saw how much you liked it on your blog, too. Like you I added the lemon to the cavity, as I always do with any roast chicken. I also added some harissa to the gravy for a bit of a kick to compliment the sweet apricots and dates. Mmmm... sweet and spicy - can't be bad! I love a good roast chicken! Sylvie, that roasted chicken looks fabulous...the perfect brown colour and the spices must have drove the neighbors crazy with the aroma.